THREE young sportsmen took out the main sporting awards at the Derwent Valley Council Australia Day celebrations last Tuesday. The award for Sports Team of the Year went to the New Norfolk Rowing Club's under 21 men's crew, Matt Byrne and Nathanial Graham. During 2015 Byrne and Graham represented the New Norfolk Rowing Club at state and national championship regattas with excellent results. Both were selected for the 2015 Tasmanian Youth Eight Squad for the 2015 as well as being chosen for the Tasmanian Institute of Sport Development Squad. 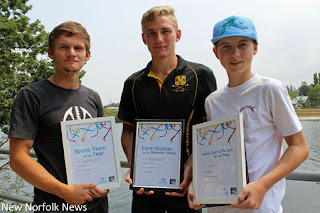 In 2011 Byrne was named the Derwent Valley municipality's Junior Sportsperson of the Year. The title of 2016 Junior Sportsperson of the Year went to Tyron Bailey. Presenting the award, Mayor Martyn Evans said Bailey had represented Tasmania in schoolboy football. "He is also active in the sports of swimming, running and cricket," Cr Evans said.